It started with us waking up to a thunderstorm Monday morn which included hail! 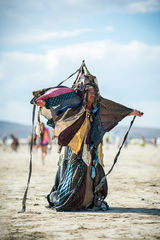 Not your normal occurrence on the playa to say the least. Not only did ground turn to crazy stick/slippery mud but it shuts down the entire event, which meant half of Black Rock City was still waiting to enter and set up the remainder of the temporary oasis in the desert. We had a good time trying to get around and assess the situation. Unfortunately, for a reason that is still unknown to me, I didn’t grab my camera bag and head out to explore. Part of that being how difficult it was to get around and part was probably the precedent which ended up being set for the week. 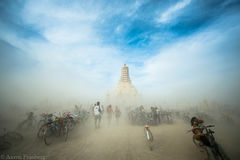 Burning man is a participant based event. In fact it’s one of the 10 Principles. Radical Participation. None of Burning Man would happen without its participants. We ARE the festival. That goes from the events to the music to the art. Every aspect of Burning Man. This is one of the very reasons that dressing up is so prevalent. One it gives us another Principle; Radical Self-Expression but at the same time we are there to entertain each other. No by-standers. While each year I’ve been a rabid participant during my week on the playa this year I seemed to not pick up the camera as readily. Is it because I’ve been there twice before? Was I more engrossed in the day to day doings and experiences? Was I not as inspired?